A surgeon makes a small incision in the groin, and ties or clips the veins. The surgeon may use an operating microscope or wear glasses with magnifying lenses to preserve small arteries supplying blood to the testis. A surgeon uses a telescope called a laparoscope to find the veins inside the abdomen and tie or clip them. A radiologist threads a small tube through the veins and injects material to plug them. Most surgeons who specialize in male fertility prefer to use an operating microscope or wear glasses with magnifying lenses to perform the procedure, but excellent results can be obtained with either laparoscopy or radiology. A man should ask his doctor about his or her experience, what he or she prefers and why. 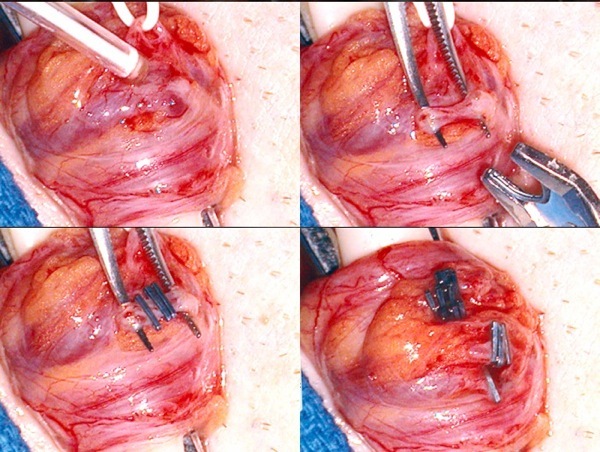 This series of pictures shows what the procedure looks like under the operating microscope. The surgeon uses a small probe to listen to the veins as they sound different than arteries. In this procedure, titanium clips were used to block the veins, but surgical suture can also be used. Thanks, Mr. Smith, for asking a great question! You are currently viewing the archives for May, 2012 at Male Health.